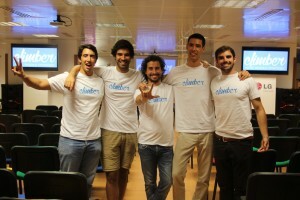 International Master in Tourism & Hospitality Management Alumnus Mário Mouraz is the co-founder & CEO of Climber Hotel, a hassle-free smart Revenue Management Solution (RMS) that helps independent hotels maximize profits. He shares his experience at EADA and explains his new venture. What made you decide to do a master in the area of hospitality management? Why EADA? I wanted to study hotel management when I first started university, but I decided not to focus my bachelor on such a specific area and instead went for a broader field – Management. After three years, I still wanted to work in hotels, so it became obvious that I needed to study hotel management. I wanted to study abroad, so I chose EADA because it offered the best quality for the price. Barcelona was also one of the reasons I chose EADA. What surprised you most at EADA? The fact that there were 50 different nationalities was just amazing. I never ever imagined I could see and experience so much of the world in just one place. I still remember the first day when Jordi Diaz asked us to raise our hands if we were there to take a step forward in our professional careers. I reached really high! Besides the diversity, the case study method was something I enjoyed a lot, as I was coming from a very theoretical undergraduate degree. What was your most valuable academic experience at EADA, and why? There are two things for which I am very grateful to EADA. First, the multicultural environment. It really allowed me to open my mind. I started thinking global, which was my initial motivation for taking the Master…and meanwhile, I made friends for life. I’m proud of what I’ve achieved and of all the experiences I’ve had in my life. And there’s still so much I want to do…EADA played key role in that. The second most valuable aspect of the programme was the experienced professors. I remember moments in classes that taught me life lessons, like when Prof. Manuel Marin asked us to write down where we wanted to be in 5, 10, 25 and 50 years. Never in my life had I really thought about it properly. Tell us something about your non-academic experience at EADA. I wanted learn about and be involved as much as possible, so I took part in the Green Society workshops, played on the EADA football team and went to a few Keiretsu Forum meetups. I believe all that helped me broaden my horizons. I didn’t know that 6 years later I would be pitching my own company to some of those same investors. How did attending EADA affect your career? After EADA, my career development was non-stop. I moved to live and work in Peru, London, Iran and Burkina Faso; launched 3 companies; taught at a university; and, most importantly, found what I love to do – be an entrepreneur. I’m happy I had the chance to try out different areas and roles within the travel industry. I still get to travel and I wake up every day motivated to keep pursuing my dreams. Can you share your entrepreneurial journey with us? From the time I was at university, I knew I wanted to set up my own company, but I thought that it would happen when I was 32 with kids. I always used to have different business ideas, but I never put them into action. At EADA, I had the opportunity to learn how to do a marketing plan, an expansion plan and to write a full business plan as part of my final project. Then something happen in my life which gradually helped me realise I was able to surpass all the obstacles life put in front of me. That something was my time spent living abroad in Iran and Burkina Faso. Burkina Faso is one of the poorest countries in the world, and while there, I lived in a slum without a room, a toilet or a fridge, despite the 35ºC heat. For 9 months, I ate smashed corn with fried fish every day – to this day, I can’t stand the smell of it! Most evenings we didn’t have electricity, so I used to go up to the rooftop to read entrepreneurship books. It was there that I eventually started designing what later became the business plan of my first startup. 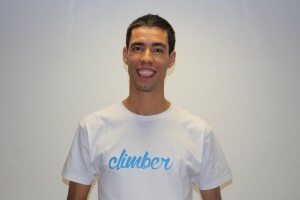 I understand that Climber is your third start-up. How did you came up with the idea for Climber? What are your plans for the future? Climber is a revenue management tool that helps independent hotels maximise their revenues and save time through a dynamic price optimization tool. How did I came up with the idea? There were two key factors. The first factor was something I learned while speaking with hundreds of hoteliers during the running of my second company. I understood that they were missing a tool that would price their rooms automatically according to market offer and demand. Such a tool was inexistent or unaffordable in the market for the majority of the hotels, so I decided to create it. The second factor was something related to my studies at EADA. I remembered that, while at EADA, there were two areas I was particularly interested in: expansion and revenue management. This seemed to confirm that it was the right moment to create Climber. Right now, Climber is made up of 9 people. We are entering the market making the first sales and we have ambitious plans to move to 5 different countries in Europe in the next 2 years. How have you leveraged EADA’s alumni network in your professional (and/or personal) life? I have friends for life from EADA from all over the world. I still meet former classmates regularly and two EADA professors actually became advisors at Climber. I am sure in the future I will be doing business with EADA contacts (Mauro, are you reading this?). Build your network. I understood the importance of building my network while at EADA, and right now my professional network has over 5,000 contacts, which brings in something interesting every day – business opportunities, job offers, meetups, invites, etc. Exclude options. If you don’t know what do to in the future, find out what you don’t want to do. Try different stuff. Say “no”. Do everything you want to do and not what your family, friends, professors or partners want you to do. It’s your life. Follow your passion. Interview conducted by Laila Tatel Bazham, International Master in Tourism & Hospitality Management 2016.